In her book, Behind the Beautiful Forevers, Katherine Boo chronicles the lives of the squatters in a slum called Annawadi on the outskirts of Mumbai’s airport. Boo provides an intimate look at a changing India and the divide between the rich and poor. In this case, the divide is physical. Annawadi sits behind a concrete wall plastered with advertisements for a floor tile company with the slogan “Beautiful Forever.” This installment of the Literary Animal: Reading India blog series, will highlight some of Boo’s literary reportage. Boo provides a picture of this new wealth and its excesses: “pink condominiums and glass office towers had shown up near the international airport. One corporate office was named, simply ‘More. 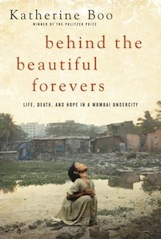 '” Behind the Beautiful Forevers looks at the informal unorganized economy in this shadow city. Scavengers found growing opportunity in discards. But this way of life took its toll as waste pickers became vulnerable to danger and disease. Abdul could predict which one of the scavengers would be the next one to die. Boo writes that “as India began to prosper, old ideas about accepting the life assigned by one’s caste or one’s divinities were yielding to a belief in earthly reinvention.” Behind the Beautiful Forevers is also a window into the newfound aspirations of its residents, particularly its women. We meet Asha, who dreams of being the political slum lord and her daughter, Manju, who is slated to be Annawadi’s first female college graduate. The women enjoy the small freedoms and opportunities that rural village life would deny them. Friendships formed across caste and religious divides. But slum life brought a different set of challenges. “Too many Annawadi females, wanted to die,” one young boy observes. Abdul and his family are wrongly accused of the murder of their neighbor, a woman who set herself on fire. Boo documents the family through the whole legal process. There are other deaths in the slum, however, which don’t receive any police investigation or inquiry. When the “forces of justice” do come to Annawadi, Boo observers, the beneficiaries turn out to be horses. Robert the Zebra Man, who paints stripes on his horses, ran an illegal racing operation, which one day resulted in two horses veering off course, plunging off a bridge to their deaths. A newspaper photographer was present to capture the landing, and the published photos began to stir public outrage. To read the other posts in this blog series, Literary Animal: Reading India, click here.